Get answers to many frequently asked questions about NS Wheeling-Nisshin, Inc., an industry leader in the production of corrosion-resistant, hot-dipped, coated steel. What products does NS Wheeling-Nisshin supply? What markets does NS Wheeling-Nisshin serve? Why is ZAM®'s corrosion resistance superior to other coated products? Why is ZAM® considered to be 'a bridge' between galvanized steel and stainless steel? Where can I get SDS for your products and after treatment Chemicals? Who do I contact if I am interested in your products? How do I get access to the secure portion of your website? How can I buy NS Wheeling-Nisshin's non-prime material? Who do I contact for delivery and pickup appointments? Do any of NS Wheeling-Nisshin's products meet the Energy Star Qualification? What is the recycled content of NS Wheeling-Nisshin's products? Is there any mercury present in NS Wheeling-Nisshin's products? Are NS Wheeling-Nisshin's products made in the USA? Q: What products does NS Wheeling-Nisshin supply? A: NS Wheeling-Nisshin supplies all five of the major hot-dipped products, including Aluminized, Galvalume®, ZAM®, Galvannealed, and Galvanized. Q: What markets does NS Wheeling-Nisshin serve? A: NS Wheeling-Nisshin's products are used in the automotive, appliance, HVAC, building and construction industries. Q: Why is ZAM®'s corrosion resistance superior to other coated products? A: ZAM®'s unique chemical composition of Zn, Al and Mg combines to form a very tight and hard coating layer. This unique coating develops thin film byproducts that are remarkably corrosion resistant, even over cut or perforated edges. Q: Why is ZAM® considered to be 'a bridge' between galvanized steel and stainless steel? A: ZAM® offers superior corrosion resistance to galvanized steel but at a fraction of the cost of stainless steel. Applications that require high levels of corrosion resistance and low cost may prove perfect for ZAM®. Q: What is ISO 9001 Certification? A: ISO 9001 Certification is evidence of a quality management system based on a number of proven principles that include strong customer focus, the motivation and implication of top management, the process approach and continual improvement. As such, NS Wheeling-Nisshin consistently provides products that meet customer requirements and enhance customer satisfaction through the effective application of the system. Q: Where can I get Safety Data Sheets for your products and after treatment chemicals? A: All SDS for our products and after treatments are available on our web site under the "Products" heading on the menu bar by selecting the "Safety Data Sheets" option. Q: Who do I contact if I am interested in your products? A: NS Wheeling-Nisshin's Commercial Department will be happy to handle your inquiry. Contact information is available on our web site under the "Contact" heading on the menu bar. A: Contact your Trading Firm representative or NS Wheeling-Nisshin Sales Team. Q: How do I submit a resume? A: Information about careers at NS Wheeling-Nisshin and submitting a resume can be found on our web site under the "Contact" heading on the menu bar by selecting the "Careers" option. Q: How do I get access to the secure portion of your website? A: For Customer Login access, please contact your Trading Firm representative or NS Wheeling-Nisshin Sales Team. For Carrier Login access, please contact Cory Barker at coryb@wheeling-nisshin.com or (304) 527-4826. Q: How can I buy NS Wheeling-Nisshin's non-prime material? A: At this time, all of our non-prime material is under contract and is not available for general purchase. Q: Who do I contact for delivery and pickup appointments? A: If you have a Carrier Account on our website, log on to schedule your inbound and outbound loads. If you do not have a Carrier Account, contact Cory Barker at coryb@wheeling-nisshin.com or (304) 527-4826 to have an account created. If you want to schedule an Inbound load without creating an account, contact Anthony Moffo (AGL) at anthonym@wheeling-nisshin.com or (304) 527-4832 or David Nixon (CGL) davidn@wheeling-nisshin.com at (304) 527-4814. For pickup appointments, contact Cory Barker at coryb@wheeling-nisshin.com or (304) 527-4826. You must have a load number to make a pickup appointment. Q: Do any of NS Wheeling-Nisshin's products meet the Energy Star Qualification? A: Wheeling Nisshin's Galvalume® and Galvalume® Plus products have been qualified for the Environmental Protection Agency's ENERGY STAR program. Please refer to the program's web site at www.energystar.gov for further information. Q: What is the recycled content of NS Wheeling-Nisshin's products? A: NS Wheeling-Nisshin purchases cold rolled steel which is produced by several domestic manufacturers. These manufacturers have the ability to make steel with either an electric arc furnace or the basic oxygen process. Both of these steel making techniques use a minimum of 25 percent recycled steel content. Q: Is there any mercury present in NS Wheeling-Nisshin's products? A: None of the materials used in the manufacturing or packaging of NS Wheeling-Nisshin's products contain mercury. Q: Are NS Wheeling-Nisshin's products made in the USA? 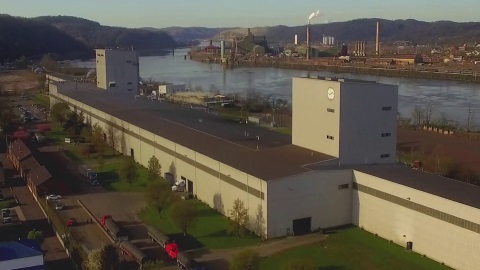 A: All products sold by NS Wheeling-Nisshin are coated in Follansbee, West Virginia, U.S.A. and the base metal is purchased by NS Wheeling-Nisshin from steel companies within the United States. ZAM® is a highly corrosion-resistant hot dip coated sheet product that offers superior performance to other products. Take your own personal tour of our amazing facility to learn where we came from and where we are going.